THE MAN as far as TV science is concerned, JOHNNY BALL masterminded the THINK series as a cross between Carl Sagan and Max Miller, hosting a solid decade’s worth of one-man maths and science programmes with a precisely judged mix of clear, concise explanation and affably boobish ‘mad uncle’ tomfoolery. 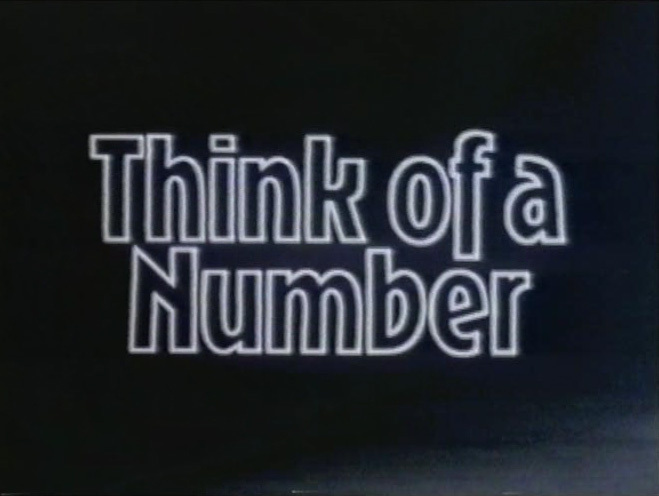 First lady of Children’s BBC CYNTHIA FELGATE oversaw original series THINK OF A NUMBER (1977-84), which took the form of a ‘light-hearted lecture’ on a general theme (the body, light, gravity, computers etc.) in front of an audience of keen but unrowdy T-shirted kids. Other staple elements included a moment of ‘quiet wonderment’ where the lights would go down, some Jean Michel Jarre-esque music would fade in, and an elaborate model of a satellite or quartz crystal would be lowered from the ceiling, over which Johnny would drop the music hall stylings and simply wax lyrical, with breathlessly earnest enthusiasm. 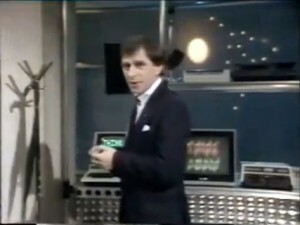 And, of course, there was the obligatory mind-reading magic trick (“It’s a trick! If you’d like to know how it’s done, write to me, Johnny Ball, Think of a Number, and I’ll tell you!”), usually involving a front row audience member as willing stooge. (“Round of applause! Not for me, for them!”) It’s instructive to note that Johnny was, perhaps uniquely in the annals of children’s television presenting, capable of remaining both authoritative and immensely likable despite constantly laughing at his own incredibly weak gags. 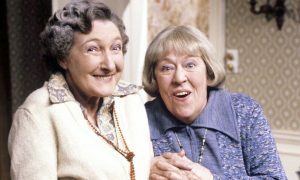 Spin-offs appeared thick and fast. 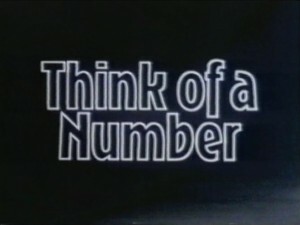 From 1981, …Number alternated with THINK AGAIN, which was pretty much the same format but with the studio audience dispensed with, more in the way of filmed reports and full-blown EUREKA!-style historical sketches, and a more sober hi-tech bachelor pad set (complete with Commodore PET displaying the show’s logo on a shelf) for Johnny to be zanily enthusiastic in, which many impressionable kids assumed was his actual house, despite him clearly leaving via the front door at the end of each half-hour. Each edition was accompanied by a free Ball-penned duplicated factsheet available via an SAE to Wood Lane. THINK! 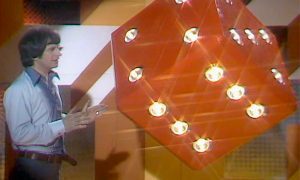 BACKWARDS (1981) was something of an overlooked gem, a numerically themed daily series in the summer holidays counting down from ten to one over a week. 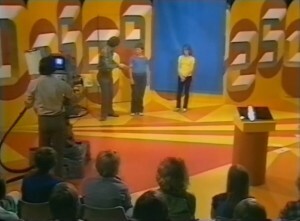 Much play was had with reverse introductions (“Ball Johnny is name my, Backwards Think to again once welcome and hello!”) and the suspense was kept with a ‘teaser’ puzzle at the end of each edition, with the answer cunningly withheld until the start of the next. THINK! THIS WAY (1983) did the same, working its way round the points of the compass. After the main franchise was wound up, Johnny found a series of further vehicles which retained the old spark, even if …Number veterans felt the glory days were beginning to fade a bit. THINK IT, DO IT (1986-7) was a sober, vocationally-oriented series looking at a different sphere of the world of work each week. The terrible puns were needed more than ever during a whole 25 minutes about becoming a dentist. (Sadly ‘mystic’ was not one of the career options considered.) KNOWHOW (1988) fatally sought to dilute the Ball magic with the addition of superfluous youthful stooges MARK SALTER and ANN DE CAIRES (no, us neither). Ball saw sense and jumped ship to Central Television for JOHNNY BALL REVEALS ALL (1989-94), wherein good old CLIVE DOIG allowed him to run riot among a studio audience once more, though this time in an unremarkable white studio limbo, and with a break-dancing Plasticine globe in the title sequence. Still, it was the same old Johnny underneath. And when that packed in, he maintained the lecture tours of schools, colleges and function rooms for longer than you’d have thought humanly possible. Whatever he may have done in recent years (and we’ll highlight the time he appeared on NEWSNIGHT captioned as “Maths Enthuser” and ignore the rest, if we may) the Think canon remains a mammoth achievement in getting school-weary kids off the sofa and thinking about silicon chips of a Friday afternoon. CONNECTIONS in short trousers, if you will. 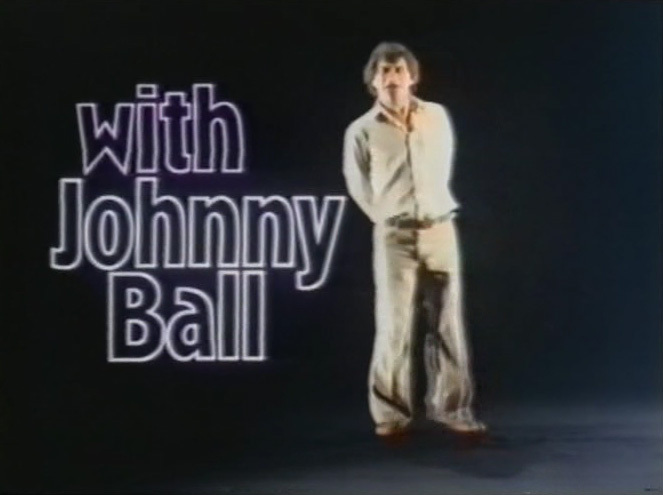 Johnny Ball is a tv legend. It’s a shame hes not on TV today. TV was so much better in the 80s *Sigh*. I don’t think it was a rip-off, I think it *was* Pulstar wasn’t it? 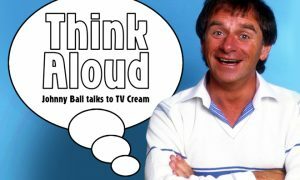 About 18 months ago I booked Johnny Ball to do a show for trainee maths teachers – it was exactly like an episode of Think of a Number. He even did the mystic/me stick joke. I was in heaven. Then he started talking about global warming. Oh dear. I am going to be teaching some functional skills mathematics (ie basic stuff) very shortly and Johnny Ball is definitely the go-to man for tips on how to do it. Johnny is a TV legend. He totally should be back on TV. He does tend to talk more about global warming these days but GOOD FOR HIM for having opinions and being passionate! He’s not just living off his previous fame, but genuinely wanting to challenge opinions and scientific ‘facts’ today. I’d love him to have another TV series, if only to shake everyone up a bit!